Leave nature as natural as possible – this is the motto of the Salus plant juices. Salus fresh plant juices contain the juice from freshly harvested, certified organically or wild grown plants. The advantage of the Salus fresh plant juices compared to other forms of herbal preparations is that only the fresh plant juice contains the whole complex of active ingredients because the pressing process doesn’t affect the structure of the plant components. This natural complex of natural ingredients works together to produce a value that is greater than the sum of their individual values. As the active ingredients are already absorbed in liquid form all the goodness of nature, as captured in Salus plant juices, is absorbed very efficiently by the body. Salus fresh plant juices are suitable for those people who want to influence all vital processes of the body in a very gentle and long term way in order to stay healthy and to maintain vitality. All juices are suitable for vegetarians and vegans. 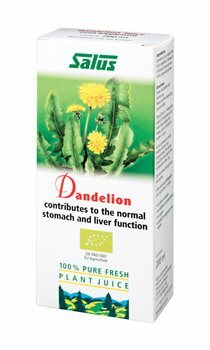 Dandelion may help support the urinary system. 100% Pure Fresh Plant Juice. Natural dandelion juice made from fresh plants, 100% organically grown. Shake the bottle well before use. Take 20ml (=1 measuring capful) of natural black radish juice 2 - 3 times daily before the meals, pure or diluted in water or juice. Do not drink directly from the bottle. After opening refrigerate and use within 2 weeks.